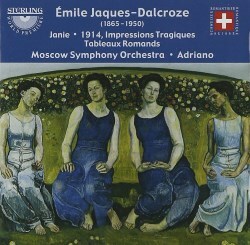 Jaques-Dalcroze (originally just 'Jaques') was born in Vienna of Swiss parents. He studied in Paris, Geneva and Vienna with his teachers including Robert Fuchs and Bruckner. Sterling have issued two discs of his orchestral works. The conductor is that warm-hearted advocate of desperately neglected romantic music, Adriano. I will have a look at CDS-1057-2 first. The Suite de Danses has many lightly enchanting faces. There’s a velvety sentimental Lehár element to be heard here and more than a few traces of Massenet and Elgar. The Moderato is a chirpy and memorable movement - a hit, a palpable hit. There’s also a sort of hesitation waltz with a speckle of birdsong. It’s all gay and carefree: like the lighter Coleridge-Taylor with a dash of Tchaikovsky. The Andante has Bachian antecedents. Poème alpestre sports the rustic innocence of horn-calls and sturdy peasantry working in the fields. Its forebears must surely include Beethoven's Pastoral. It might potentially have been a launch-pad for the more knowingly enchanting Sommernacht by Othmar Schoeck – the latter a master-work of the string orchestra literature. The Thirteen Variations on La Suisse est belle are winkingly playful and rustically inclined. Occasionally you catch a similarity with Schmidt’s Hussar Song Variations although with a lighter palette deployed. The moods encompass soporific, jaunty and chattering. The Alla fanfara section harks back a little to Poème Alpestre. Then again one might think of Ketèlbey's Bells across the Meadow in variation 12. The Philistine March finale tramps along nicely with some effective repetitively rolling work from the trumpets; almost military bandmasterish. The Suite de Ballet draws on Jaques-Dalcroze’s four-hour opera Sancho. Sancho was written amid the composer’s euphoria over the success of his opera Janie. It’s all light on the palate: Iberiana with flute curlicues and the 'tizz' of the tambourine. Again what we hear is very much on the same tropic as the suites by Massenet and Grieg; delightful stuff. The dark cawing of the brass at the start of the Mouvement de Valse does not prepare you for the ingratiating waltz that follows with its interaction and echo with the Moderato from the Suite de Danses. This is definitely for you if you are a collector of the lighter music of Massenet, Grieg, Arensky and the ballets of Tchaikovsky. The writing is highly skilled and the music is despatched with charm and the suggestion of an affectionate chuckle. The second disc continues the theme but displays other inspirational seams. The opera Janie is quarried for two orchestral bon-bons. The Prelude rustles and bustles with village chivalry and rustic romance. There are horn fanfares as well as serene moonlit scenes for the woodwind. The music seems a cross between the countryside visions of Bruckner and the Tchaikovsky of the orchestral suites; very agreeable. The opera's Danse Villageoise, in its brilliance and rhythmic life, owes its magnificence to Massenet's Le Cid and looks to a future that includes de Falla's Tricorne. We are told that Tableaux Romands is Jaques-Dalcroze’s largest and most advanced symphonic work although the destruction of many of his manuscripts during the bombing of Germany in the 1940s makes it difficult to gain a full perspective. The Tableaux are drawn from the music he wrote for the 1903 centenary of the Vaud canton joining the Helvetic Confederation. This was a massive enterprise and from the many hours of music he wrote he mined both the Tableaux and the Suite de Ballet. There are five tableaux - each a free rhapsodic picture: L’Alpe; Un clocher ... au loin; Travail; Le Lac; Kermesse. The music of L’Alpe is vividly allusive, with Parsifal-like shimmering strings. Horn-calls echo from Alp to Alp. These are countryside images, romantically idealised vistas and if the distant bells and ardent viola solo in Un clocher ... au loin lack the psychological grip of Vaughan Williams' Bredon-heard bells this is still a lovely piece and without any trace of Ketèlbey-kitsch. The playing and concentration of all involved is deeply impressive. Travail is as dogged and serious as the title suggests with the occasional remission (4.10) from labours. Le Lac, after a shivering start, projects an idyllic peace over a barcarolle-like line. The serenading strings sing out with ardent Brucknerian confidence yet so sweet that the listener may also think of Lehár and Mahler. So we come to the final Kermesse. This is chuckling, bright-eyed and eager. Overall the Tableaux are suave, extremely accomplished, romantic certainly, and Brucknerian in a pictorial way - listen to the last two minutes of Travail. I wonder if Strauss heard this piece before writing his Alpine Symphony in 1913. The Moscow Symphony are used to turning their hands to a very wide range of music - the essence of a professional orchestra. You can hear this notably in the superb work of the horns and the woodwind. The hall is a shade on the resonant side but nothing too distracting. As for the annotation it is typically thorough and approachable. Given the intensity and variety of mood I was much more impressed with this second collection than with the first but there is nothing across these two discs that is less than amiable and often so much more.